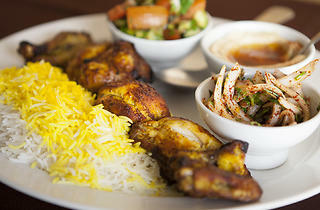 Glendale is a hotbed for kebab cookery, and Adana avoids easy classification. Edward Khechemyan is of Armenian descent, with a father from Iran and a restaurant name that refers to a city in southern Turkey. Basically, Adana is a flavorful mishmash. The restaurant features a neon purple sign, arched walls and hand-painted frescoes. 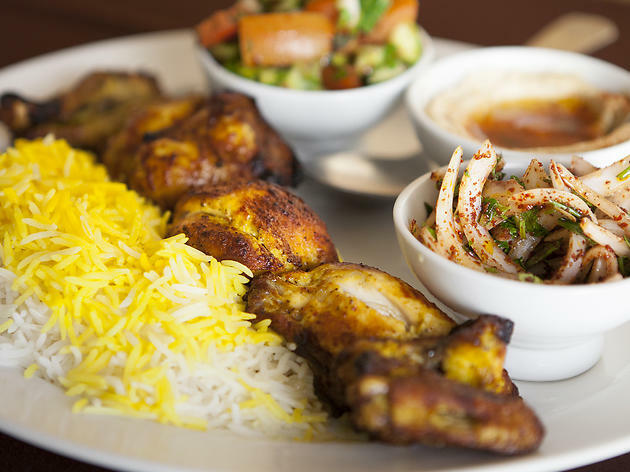 Khechemyan is clearly skilled on the grill, and his best offering is Hatam ($12.50), featuring marinated Cornish game hen, which he dismantles and serves in bone-in, saffron-stained chunks that sport winning sears. Pita bread and a squeeze-worthy lime round out each plate. Recently appearing on renowned food critic Jonathan Gold's list of top LA restaurants, I had to try Adana. It did not disappoint, Adana has the freshest and tastiest stuffed grape leaves I've had. Their hummus is also authentic and complements it's pita very well. I highly recommend any kebob dish, their meat is tender and hardy. Best spot in Glendale, HANDS DOWN!